I went down to Academy and plunked, down the money and took home the little Beretta Storm PX4SC . I own one other Beretta ,the P92FS, and I have high expectations for this gun. It’s a kewl looking gun. Lots of curves and the business end of the barrel is flared making it look bigger than a 9mm has a right to be. A few nice touches such as the skelitised hammer and picininy rail. A small indentation is a spot to rest your trigger finger safely away from the trigger. It is one of the biggest guns I’ve ever seen that is called a subcompact, still its a lot smaller than anything else I own. There is lots of plastic in this piece. The body and guide pin are plastic, and I think the trigger is plastic. The barrel is stainless and the other parts are coated carbon steel. The black matte finish is very nice but the 2 magazines are quite glossy. Engraved proudly on the right hand side is, “Made in U.S.A” . Yes, this is a quality American made gun made with the American concealed carrier in mind. The plastic case the the gun comes in has a manual tucked away under the the foam, a 2 year extension on the one year warranty. 2 magazines , a mag loader, and a California certified lock. It is nice to know the lock is approved in California even if the gun is not. The new gun oozed oil over the place, and even after a wiping down just oozed some more . I always clean any new gun anyway, but this one was really going to need it. Take down is pretty straight forward is pretty similar to the P92, remove the Mag, pull the slide back, pill the take down lever out, rotate 90 degrees, down. Pull out till it clicks and let the slide slowly go forward on till its removed. You don’t want to pull the pin all the way out, because its a bit of a pain to get back in. Disassembly is 4 parts; the spring assembly the slide, the barrel and the plastic body. I couldn’t wait to taker this to the range. Although I didn’t have much time or ammo. The First couple of rounds at 15 Yards were very low. I compensated and the next couple of rounds were right on target, and tight within a 2 inch circle. by the time I finished I wasn’t compensating and I was hitting where I was aiming. I don’t know whether it was me or the gun that was so inaccurate at the beginning. But I’m going to have to spend a lot of time with the little gun to shoot it consistently. 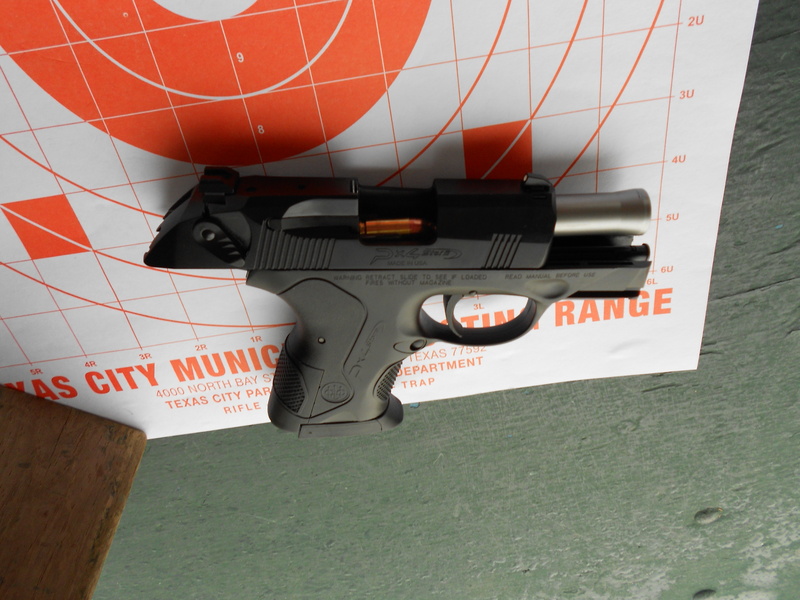 This is a fun gun to shoot, Recoil is almost insignificant, and recovery to the next shot is quick. One of the mags has a click extender to allow room for the pinky. I choose not to use it and wrap my pinky under the mag. with my supporting hand cupping underneath for support. Let’s see…it functions reliably. It is compact. It can be had with a manual safety that buys the owner some time to deal with the horror of being disarmed by his or her attacker. It holds more rounds than most of its competition and comes back on target very quickly, with a very soft felt recoil impulse. At muzzle contact distance, it’s more likely to keep working than most of its competition. It also has interchangeable grip backstraps to adjust size and fits many hand sizes well as it comes from the box. It doesn’t have the accuracy we competitive shooters like. It may take a little extra effort to load its magazines up to full cartridge capacity. All things considered, the Beretta Px4 Storm Sub-Compact 9mm has way more going for it than against it, and is a very promising pistol for someone who needs a concealable handgun that will deliver the life-saving goods in an up-close-and-personal confrontation. For an “all around use” Beretta, I’ll stay with one of my Model 92s, but for a high-capacity 9mm “belly gun,” the Px4F Storm definitely passes the acceptance test. Previous PostPerry States He Favors Gun ControlNext PostWhat’s the Point with Occupy Wall Street.